When Should I Switch Tires? There comes a time during the year where either your summer tires no longer are a viable option, or the lack of tread on your current tires become way too low. With tires being one of the most important components of your vehicle, it’s never a good idea to run incorrect rubber, or a set that’s been worn down too low. So when is the right time to get a fresh set? 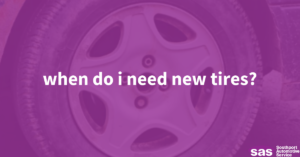 We’ve broken down a few signs below that might help you understand when you need new tires. Depending on the type of car you have, there may be specific tires fitted to it upon purchase — which isn’t necessarily a bad thing, but can pose a slight problem. For sports cars and a select few RWD vehicles, summer tires are almost always fitted onto the car, as most of these don’t see snowflakes. However these tires are not meant for colder climates, and run the risk of sacrificing traction and may begin to crack due to usage. If your vehicle has summer tires, it’s important to swap these out before the temperature drops below 50 degrees. Tire tread is imperative to keep an eye on, especially as precipitation begins to freeze and road conditions begin to worsen. Your car’s tire is considered worn out as soon as it reaches 2/32 of remaining tread life. By checking your tires with a gauge or having a shop perform this, you’ll learn when it’s necessary to swap out and recycle your old tires for a fresh set. Make sure you do this immediately in order to prevent any slippage or loss of traction when you need it most! Old tires that have been sitting around are susceptible to dry rot, and a number of other issues. In addition to drying out and running the risk of a blowout, flat spots on tires can also impair your ability to drive carefully and can be a hazard to both you and drivers also on the road around you. Make sure if your car has been sitting for any length of time, you have this inspected as soon as possible and purchase a new set of tires, if necessary. A reputable shop can easily determine if this is a threat to you!